The September issue of Merrimack Valley Magazine will be arriving on your doorstep in the next few days. Or, if you’re not a subscriber (why not?) you can find it on newsstands just about everywhere. Pick one up and you’ll get a look at one of the big jobs we worked on this summer in our latest ad. 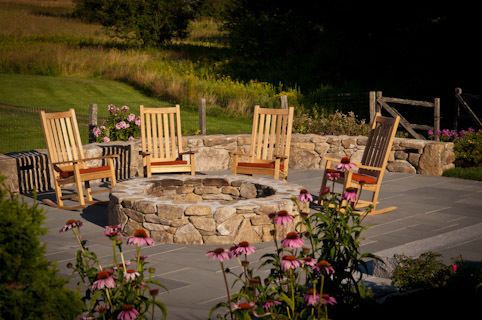 It’s a great fire pit and bluestone patio we built at one of the most gorgeous properties in Andover. 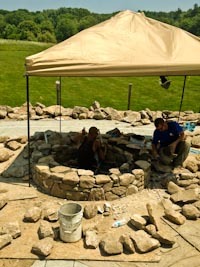 Here’s a shot of the crew building up the sides of the fire pit back in July. This was one of those days when the temperature was up in the 90s with not a breeze stirring. Those rocks get pretty heavy on a day like this! It may be hard work, but we are happy to have it and seeing the final results makes it all worthwhile. It’s a great example of creating more useful living space with hardscaping and night lighting. The family has really enjoyed sitting out by the fire in the evenings and when you see the photos you’ll know why! 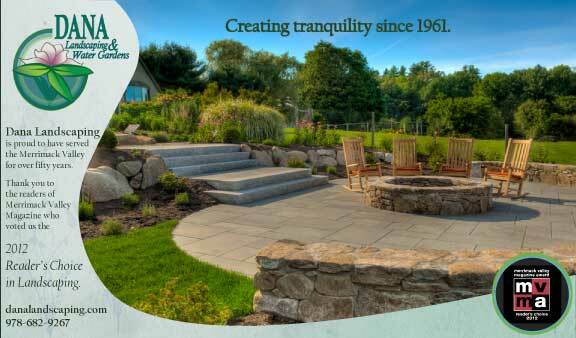 Here’s our sweeeeeet new ad and also some more shots of hardscaping by Dana Landscaping. This shot was taken before the fire pit was finished on top, but you can see the wall, patio and plantings. Previous post: Thank you for your vote!